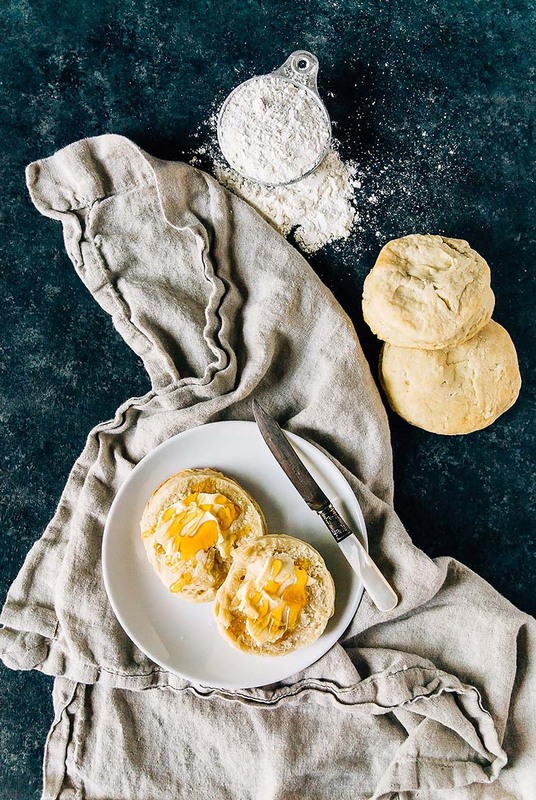 Vegan yeast biscuits are a fast and easy way to get to perfect biscuits in no time! In a small bowl, combine the almond milk and lemon juice, set aside. In another small bowl, combine the yeast and the warm water. Set aside until foamy. about 5 minutes. In a large bowl, whisk together the flour, baking powder, baking soda, salt, and sugar. Cut in coconut oil until pea sized pieces are formed. Stir in the almond milk mixture and yeast mixture until no flour streaks remain. Cover with a kitchen towel and allow to rise in a warm place for 2 hours. Preheat oven to 400°F. After dough has risen, scrape out the dough onto a well-floured surface. Knead for about 30 seconds until dough comes together and starts to get more elastic. Add a bit more flour if dough feels too sticky, but be careful not to add too much flour. Roll out dough to about a 1-inch thickness. Line a rimmed cookie sheet with parchment paper or silicone mat. Using a biscuit cutter, cut dough into 12 biscuits. Place the well-floured biscuits onto prepared baking sheet. Bake for 11-13 minutes, until biscuits have risen and are golden brown.